While working with the manure in my rasied bed, I found this!! I quickly had to do my reseach to identify this solid beetle. Aha! 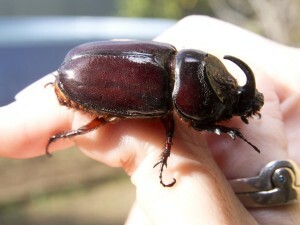 Oryctes rhinoceros, Rhinoceros beetle is a serious insect of coconut palm. 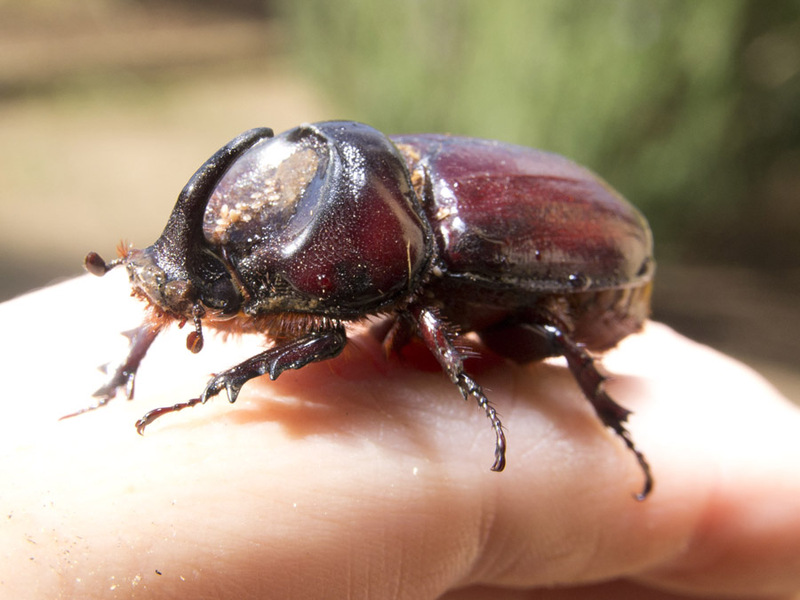 It is also known as Asiatic rhinoceros beetle, black beetle, coconut black beetle, coconut palm rhinoceros beetle, coconut rhinoceros beetle (English), date palm beetle, or dung beetle. Known to be native to the southern Asiatic region, the coconut rhinoceros beetle was introduced throughout the Pacific primarily as a result of the increased sea traffic during World War II (Nishida & Evenhuis, 2000). The beetle breeds in dead standing coconut palms killed by pest /disease/ lightning, decaying organic materials like compost and sawdust heaps.Transportation of this material could be a pathway of introduction to new areas. The coconut rhinoceros beetle is one of the most damaging insects to coconut palms and African oil palm in southern and south-east Asia and the Western Pacific islands. The imagos are the destructive stage, they bore into the crown of the palm resulting in wedge shaped or “V” cuts in the fronds that unfurl. 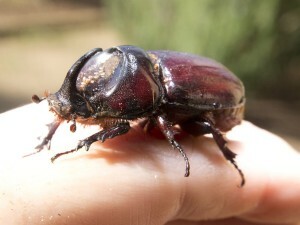 The beetle feeds on tissue juices. They live here in Croatia too but, I haven’t seen one for ages! I have seen these in books and insect displays. They are very interesting…but, yes, menacing to the plants. You got some great shots of it. thank you – it is an odd beetle – only seen in books! That’s big! I hope you (nicely) killed it! You are very brave to hold it in your hand! Hehee!! I guess I’ve become a real Earth child, can handle bugs and snakes and creepy crawlies! Just don’t put them in my hair – I go nuts! These beauties are a common sight in my part of the world every summer around Christmas time. They make a fantastic hissing noise and if they ever attach themselves to you or your clothes, they’re extremely difficult to get off!!!!! Gee! You are darn right about the attaching themselves on you! This is the first time I’ve seen one! I also found one of its ‘grubs’ in the manure too. A HUGE thing!